I am working with my Roomba 615, to make it a little bit more flexible. E.g. let it run via remote command. To do this, I use an Arduino Nano. In general, it works fine. I can start the robot and make it run. But, I cant wake it up from sleep. The general specification (and all of the hundreds of forum and google posts..) say, that one has to send a digital LOW signal (500 ms) to Roomba Pin #5 (Device Detect Pin or Baud Rate Pin). Where ddPin is my Digital Pin on the Arduino Nano Board (currently pin #1, but I tried also others). This pin is direcly connected with Pin #5 on the Roomba Interface. Then: GND of Arduino is connected with GND of the Roomba. But, it does not work. Enthusiastic Arduino Lover and Expert! 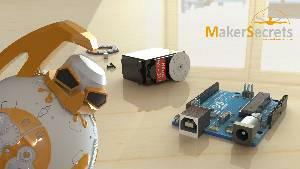 If you want to learn how to use the Arduino and build awesome projects, Checkout our Online course! Your pin might not be switched to an output straight away. And also maybe try to play with the delay of 500ms increase/decrease. EDIT: is there a way to check the pinmode, or the mode of the pin? You could hook an led up to power through a resistor, and hook it up to the pin on the nano. The led should light up only when the pin goes low. Have you tested manually that putting ground to that pin causes the roomba to wake up? Get a momentary push button switch and see if holding it down for half a second or more wakes up the roomba.